The Pines #310 is a newly constructed three bedroom condo with two bathrooms, both are ADA compliant (one is wheelchair accessible), and high end finishes in The Pines condominium building located at Whitefish Mountain Resort. 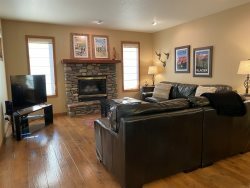 Underground parking garage, large lobby with river rock fire place, heated ski locker room, outdoor community hot tub (Winter Only), third floor gathering area, kitchen and outdoor rooftop deck with a barbecue are all amenities for guests to use. The condo has a queen bed in the master suite with a private bathroom and wet bar. The second bedroom has a queen, the third bedroom has a queen and the living room has a queen and twin pullout couch. Fully equipped kitchen, dishwasher, washer and dryer, air conditioning, balcony, BBQ and gas fireplace will make you feel right at home. Located close to the ski lifts the location offers quick access to the ski slopes. After the ski season has come and gone the ski resort switches over to summer activities. The mountain offers excellent hiking, mountain bike trails and competitions, zip-lines, tree top walks, dinning and much more. Quickly becoming a popular all-season resort this condo is located in the heart of it all. Glacier National Park, known as the Crown of the Continent, is only 40 minutes away and is one of the premier national parks in the country with hiking for all abilities, sight seeing, and wildlife along the famous "Going-to-the-Sun" road to the summit of Logan Pass. Excellent property! Very clean. Had everything we needed. Thank you so much for allowing us to rent your marvelous condo! We all had so much fun and enjoyed our stay immensely. We appreciated the little things you did to make our stay even better. We would recommend you to anyone we know and we will be back again soon!